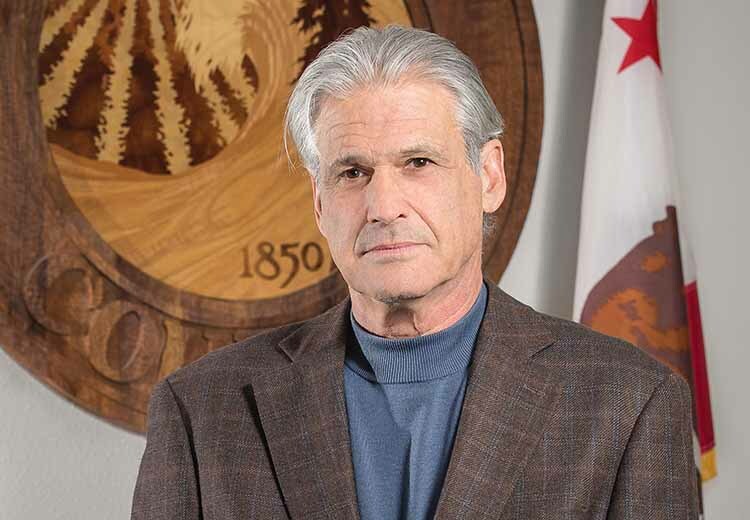 Supervisor Dan Hamburg, courtesy of the board of supervisors website. MENDOCINO Co., 11/21/18 — Fifth District Supervisor Dan Hamburg has missed several of the recent regularly scheduled Board of Supervisors meetings, as well as a several additional meetings focused on potential changes to the county's cannabis ordinance proposed by the Cannabis Ad Hoc committee, of which he is one of two members. His absence has been widely noted, particularly by local cannabis farmers, but until today no explanation had been provided by either the supervisor himself, his family, or the county government. Hamburg's first public absence was noted at the Cannabis Ad Hoc community meeting held in Willits on Oct. 29, organized so that he and Supervisor John McCowen could present proposals to the county's cannabis cultivation regulations and hear feedback from the public. He has not been present for any supervisors' meeting since, nor was he present at an all-day meeting centered on potential changes to the county's cannabis cultivation ordinance held on Friday, Nov. 16. Hamburg announced that he would retire earlier this year, and that his current term would be his last, and he did not run in the recent election. The supervisor-elect, Ted Williams, ran effectively uncontested in the general election, after his opponent, Chris Skyhawk, suffer a major stroke — he will be sworn-in and sit at a meeting for the first time in early Jan.
Hamburg's absence, coming as it has during negotiations over an important cannabis regulation ordinance, has recalled to mind the sudden absence of former supervisor Tom Woodhouse, two years ago. Woodhouse was also on a cannabis ad hoc committee, and many believed, at the time, that his absence had an effect on how various cannabis related policies were eventually hashed out. For much of the discussion of the county's cannabis regulations, Hamburg had recused himself due to a conflict of interest, but he joined the ad hoc committee to provide recommendations about amending the cultivation ordinance in July. Supervisor John McCowen told the board that the recommendations provided from the ad hoc had been reviewed by both himself and Hamburg, despite his absence. In the halls of the county offices, and on social media, many people described a feel of deja vu, in seeing a member of a cannabis ad hoc committee vanish without a clear explanation yet again.